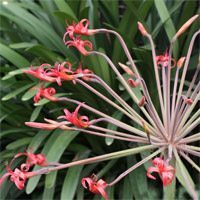 Brunsvigia, like many of the Amaryllidaceae are from South Africa and are drought tolerant that will reward you with a fantastic flower show in summer. Josephines Lily or B. josephinae (pictured right) is probably the best known of the species. Like many South African bulbs the species include both summer flowering and winter flowering species, foliage differs greatly as well. Brunsvigia require a well drained soil and full sun. All species require excellent drainage. Different species will require slightly different growing conditions, however sun and drainage are the main elements. If you are buying bulbs ask for growing instructions for the particular species. Look for B. bosmaniae, the bright red flowering B. marginata, B. josephinae, B. pulchra and B.gregaria. B. radulosa is an interesting species, but difficult to find.